As a Google Apps users, you might are seeking methods to backup Google Apps data to Dropbox. Actually, using CubeBackup, it is quite easy to add a backup copy to Dropbox with very little expense. Step 1: A Dropbox Pro or Bussiness account. For small or middle size businesses, whose data in the whole Google Apps domain is less than 1TB (1,000GB), a Dropbox Pro account is a reasonable choice. It only costs $99 per year. For comparatively large organizations, Dropbox for Business might be your best choice. The basic plan for Dropbox Business is 5TB for 5 users, which costs $750 per year. Dropbox for Business starts off with 1TB of space per user, however, you can ask for more space by contacting Dropbox’s sales. Theoretically, you can get as much as possible space from Dropbox for Business as long as you would like to pay for the extra storage. The pricing of Dropbox for Business is higher than Dropbox Pro, but is still much cheaper than other Google Apps cloud-to-cloud backup solutions, such as Backupify or Spanning. Step 2: Set the backup location to the Dropbox sync folder. After installing Dropbox client, a folder named “Dropbox” will be created. If CubeBackup has already been running on your computer, please stop the backup process first, then copy all the backup data to the “Dropbox” folder – This may take a considerably long time if you have tons of backup data. 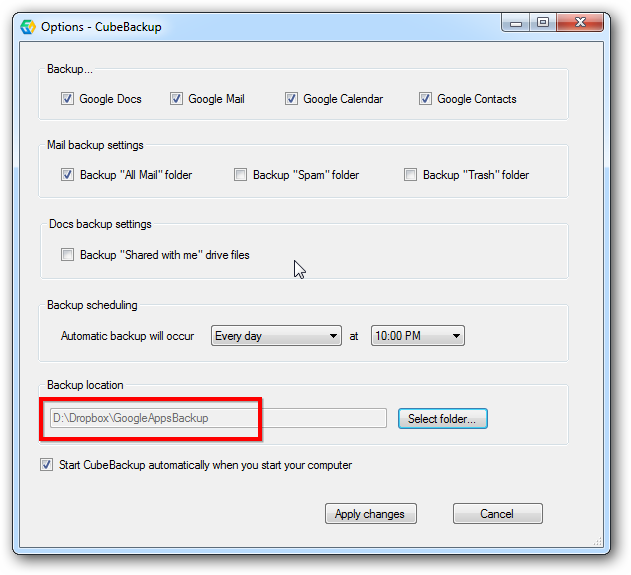 When the moving of data completed, open the “Options” dialog of CubeBackup and set the backup location to the new place. After this simple configuration, your Google Apps data will be automatically synced to Dropbox cloud storage as they are backed up locally with CubeBackup.